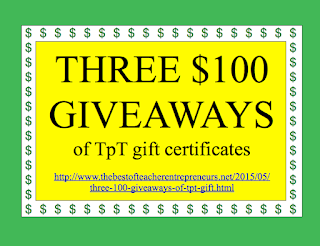 All new members and members who have renewed their membership in The Best of Teacher Entrepreneurs Marketing Cooperative from March 24, 2015 - June 1, 2015 at 11:00 P.M. Pacific Time will be entered to win the SECOND $100 TpT Gift Certificate. "Since joining TBOTEMC in January 2015, in just four short months, I have seen my TPT earnings increase by 350%! Besides learning how to best market my products, I have also joined a blog collaborative, a weekly Pinterest cooperative, and have met many teacherprenuers who share the same vision as me. Joining TBOTEMC was one of the best business decisions I have made for my TPT store!" The Best of Teacher Entrepreneurs Marketing Cooperative may no longer be sold at TeachersPayTeachers.com because it is more of a "marketing service and not an educational resource." You may purchase the $50 annual membership to TBOTEMC at http://www.thebestofteacherentrepreneursmarketingcooperative.com/2014/01/the-best-of-teacher-entrepreneurs.html. 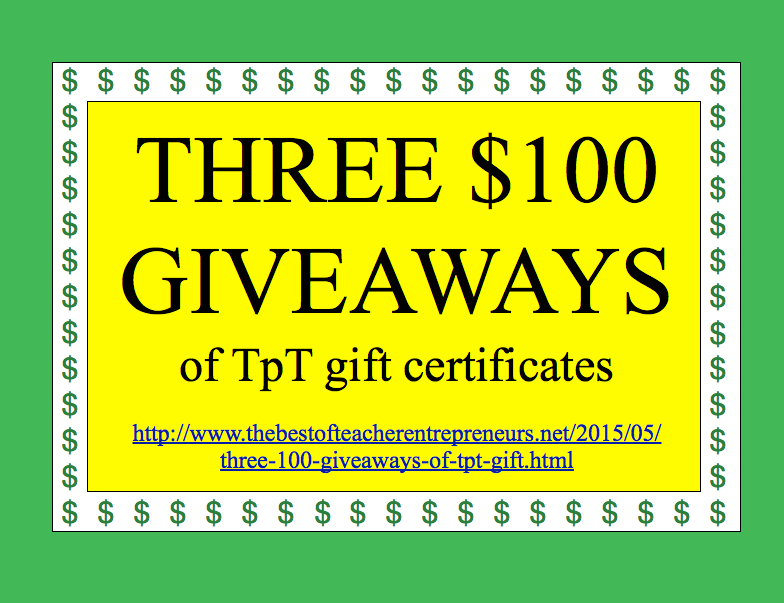 The three winners will be announced at my blog, The Best of Teacher Entrepreneurs - http://www.thebestofteacherentrepreneurs.net.